England, 1923. 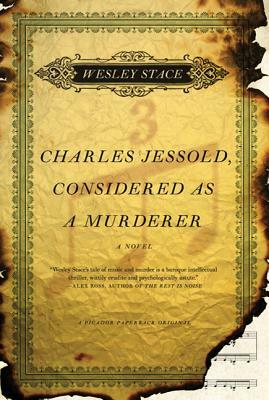 A gentleman critic named Leslie Shepherd tells the macabre story of a gifted young composer, Charles Jessold. On the eve of his revolutionary new opera's premiere, Jessold murders his wife and her lover, and then commits suicide in a scenario that strangely echoes the plot of his opera---which Shepherd has helped to write. The opera will never be performed. Shepherd first shares his police testimony, then recalls his relationship with Jessold in his role as critic, biographer, and friend. And with each retelling of the story, significant new details cast light on the identity of the real victim in Jessold's tragedy. This ambitiously intricate novel is set against a turbulent moment in music history, when atonal sounds first reverberated through the concert halls of Europe, just as the continent readied itself for war. What if Jessold's opera was not only a betrayal of Shepherd, but of England as well? Wesley Stace is the author of the international bestseller Misfortune, by George, and Charles Jessold, Considered as a Murderer. He has released fifteen albums under the name John Wesley Harding, and he lives in Philadelphia. The book's title—Charles Jessold, Considered as a Murderer—is slightly unusual and very specific. What are the literal and figurative ways in which the title may be understood? The novel purports to be a memoir of one of its characters. Is it? The narrative may also be regarded as resembling a series of nesting dolls—story within story within story. How would you characterize its structure? And why is it structured in such a way? The novel begins with a quotation from the composer Hector Berlioz: “Passionate subjects must be dealt with in cold blood.” What relevance do you feel this has to the book as a whole? At the beginning of the book, Jessold’s tragedy seems to mirror that of real-life composer Carlo Gesualdo, and also that of Lord Barnard, the doomed hero in Jessold’s opera. How does the book comment on the “biographical” approach to criticism? Do history and art repeat themselves in the book? Or in real life? The author is also a musician. Under the name John Wesley Harding, he recorded a version of Little Musgrave on his album Trad Arr Jones in 2001. Why do you think he chose to write about classical music rather than popular music? And in what ways does the novel try to mirror the structure of the ballad Little Musgrave? Were you able to imagine clearly how the music of Charles Jessold might have sounded? Have you read any other books with fictional composers? Compare Jessold to, for example, Leverkuhn in Thomas Mann's Doctor Faustus and Vinteuil in Proust’s In Search of Lost Time, or, more recently, the composers in The Lyre of Orpheus by Robertson Davies, Randell Jarrell’s Pictures From An Institution, Bernard Mac Laverty’s Grace Notes or David Mitchell’s Cloud Atlas. How much sympathy do you feel for the three central characters? Did your feelings change through the novel? To this end, is anyone in the novel “bad” or “good”? If “bad,” do any of the characters finally redeem themselves? In Jessold’s opera Little Musgrave, it is uncertain which of the protagonists is the central tragic figure? Who, after all, is the tragic figure in Charles Jessold, Considered as a Murderer? Did your opinion of this change while you were reading the book? Why was the novel set at this particular moment in European history? What is the historical and cultural context that might have led the author to set it at this time. There is much discussion of a British “national” music, folk melodies beyond foreign influence, that are part of a national DNA. Have you experienced this kind of music yourself in America and could you imagine, therefore, this novel set in America? Do you imagine that people collected folk songs in a similar way in America? The relationship between critic and artist can be fraught. Is Shepherd and Jessold’s friendship doomed from the very beginning? The novel is also about the difference between love and passion. What one step would you have taken, at the time, to avert the tragedy of 23rd June, 1923? Leslie Shepherd wants to save Little Musgrave from obscurity. Do you think his attempt will be successful in the fictional world beyond the end of the novel? Do you believe the case he has made for its reconsideration? If you have read Wesley Stace’s other novels, what similarities do you see between this novel, Misfortune and by George?